I may not always remember the exact date of the Summer Solstice, which is the longest day of sunlight and official first day of Summer, but I know I can rely on when the Irvine Greek Festival weekend starts, Summer is here. 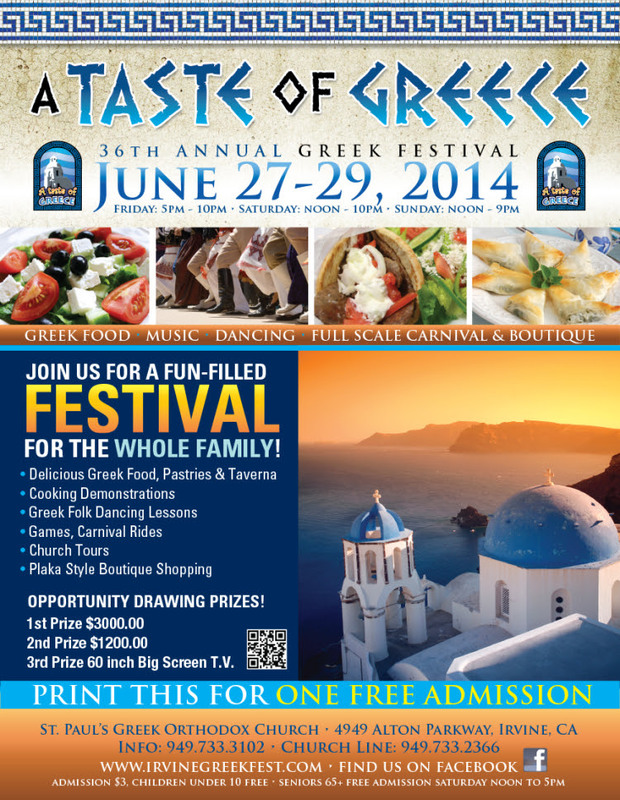 The Irvine Greek Festival ‘A Taste Of Greece’ celebrates its 36th year at St. Paul’s Greek Orthodox Church. 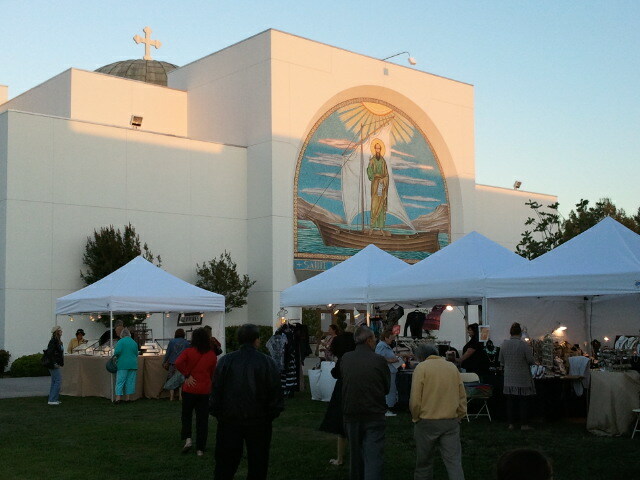 I found it to be a wonderful neighborhood event that takes place on the church grounds. It’s the perfect place to bring the family and enjoy great authentic Greek foods, boutique booth shops, plenty of activities for the kids, Greek dancing for the adults and a full carnival of rides for everyone. I think all of our mothers told us (or forced us) to eat our spinach. 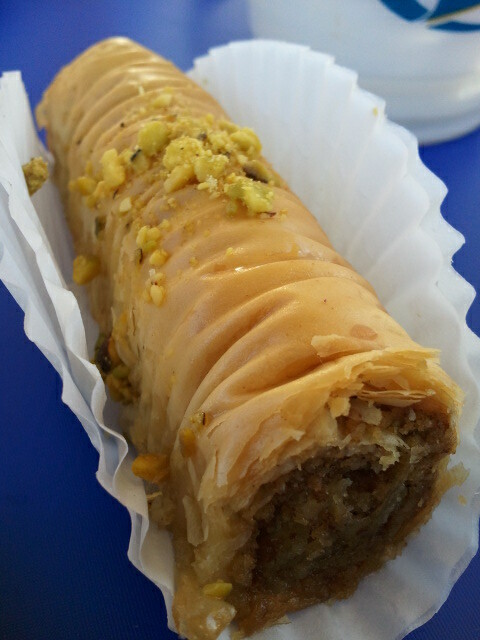 It’s an easy thing to do when it comes in the delicious Spanakopita (spinach, feta, philo dough) here at the festival. It’s definitely one of my favorite Greek foods. 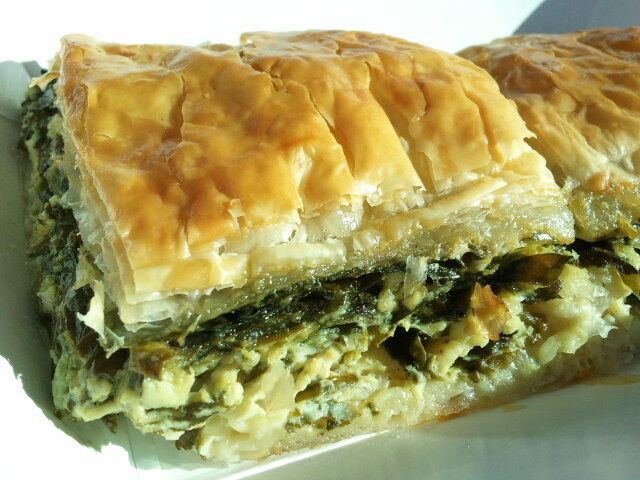 Another favorite is what is commonly called “Greek Lasagna” and Pastichio by the Greek’s. 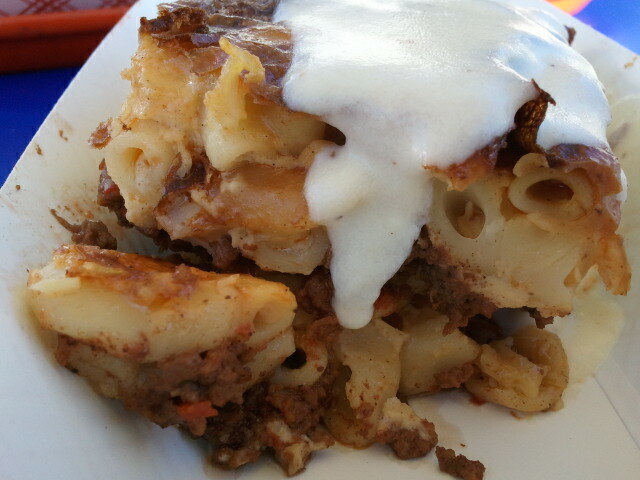 With layers of noodles, ground beef, veal or lamb, bechamel and then cheese, what’s not to love. I particularly liked the extra spoon of dripping bechamel on top, icing on the cake. 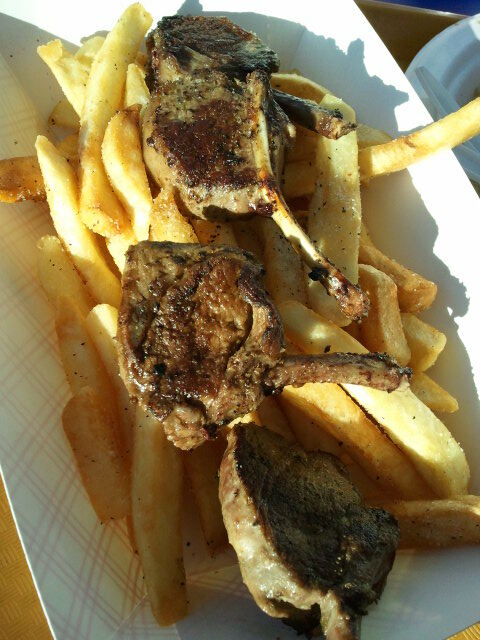 Who needs the French dish ‘Steak Frites’ when you can get freshly grilled lamb chops and Greek Fries. The chops were perfectly juicy and seared off beautifully. Now here is a Greek dish I hadn’t heard of before, Saganaki. It is cheese prepared in a small frying pan and here presented on top of pita bread. 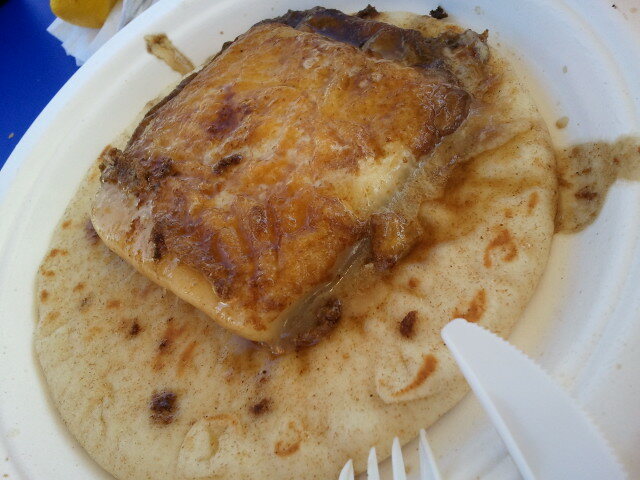 The Irvine Greek Festival takes it one delicious step further by frying it in Brandy and setting it afire. It comes out gooey and rich and finger licking good, as you smear a bit on a torn off piece of pita. If there is more than one of you, it will disappear rather quickly. Of course it can’t be a Greek Festival without Baklava, which is there but I’ve discovered that I much prefer the Sarangli which I consider a first cousin to Baklava but much easier to eat. Sarangli is also less sweet but more complex in flavor from the roasted chopped nuts, cloves, cinnamon and nutmeg, glazed with honey syrup then spinkled with chopped pistachios. The Philoptochos, St. Paul’s philanthropic group, will be baking around the clock to provide all the Greek pastries and goodies that can be eaten at the festival. They even have a baked goods counter where you can buy and take your favorites home. I’ve heard they bake an average of 14,000 individual pastries for the festival weekend. 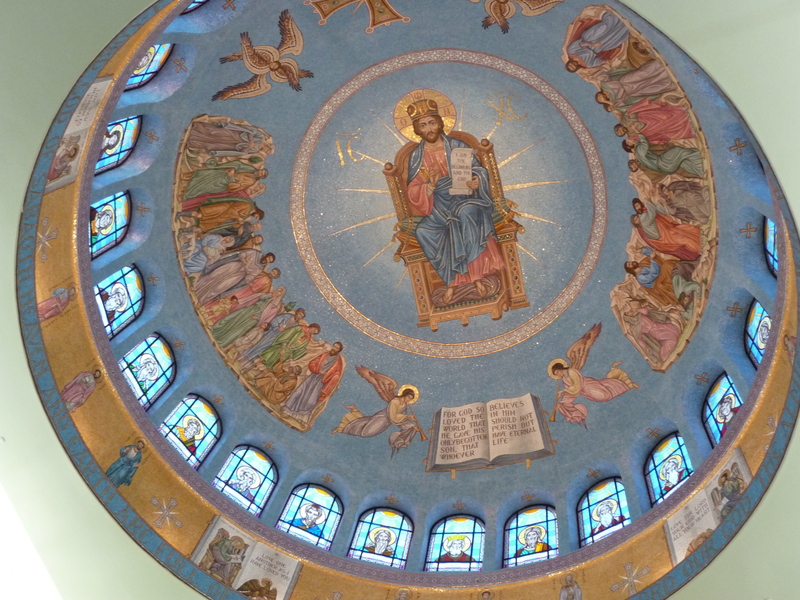 One of my most favorite things to do after I happily stuffed myself on all the great Greek food is to go into the church and gaze up at the stunning mosaic dome, ringed with Saints captured in stained glass. It a breathtaking sight. I’ll find an empty pew, slide down a bit, lean back and look upward. It’s a serene way to end a meal and I’m sure it aids in my digestion. If you’d like free admission, print up the flyer below then kick of your summer with fun and good eats at Irvine Greek Festival.